A question that we get asked fairly often is how to properly drink wine, while we believe that enjoying the wine should be your first priority there are ways to make the experience better. Here is a small guide on how to enjoy wine so that you can appreciate the flavors that go into a bottle of wine. Once you pour yourself or your company a glass of wine let it sit for a couple of moments. 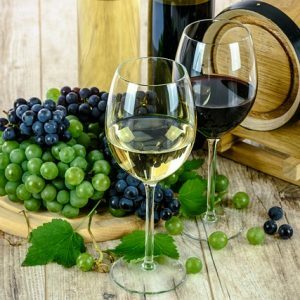 Wine is fermented and that creates CO2, some wineries will add CO2 to their bottle because it helps to preserve the wine. When you initially pour a glass of wine you will see bubbles in the glass, the bubbles can give your glass a harsh taste. Letting it sit gives you a smoother tasting wine. You have probably seen people swirling wine in their glass and wondered why they did that. There is an actual reason for this, it releases the aromas. Wine today has a much higher alcohol content than it did decades ago. That much alcohol can stop you from experiencing all the flavors of the wine and make it taste more like cough syrup rather than something you enjoy. Swirling the wine allows you to enjoy the wine without the alcohol getting in the way. Here is how and why you should swirl your wine. Yes, every expert in the world has told you that red wine should be at room temperature at least 62F or higher. You will enjoy the wine better if it is a little cooler than that. Again because of the higher alcohol content you can taste the alcohol more strongly at higher temperatures. If you chill it just slightly to around 55F you will enjoy the flavors better. No, that doesn’t mean that you should pour an entire bottle of wine into a giant glass. But a bigger glass with a small quantity of wine lets you enjoy it more. You have more room for the aromas giving you a better flavor. The best wines go together with good company. Enjoy wine with friends, good food and scintillating conversations. Don’t get too caught up in vintages and flavors and aromas. Find a good wine that you enjoy and raise a toast to friendship.